Wednesday 21st saw the LSWC hold their annual Construction Contest for the Joe Rose Memorial Trophy. Last year saw us two different versions of ATV transmitter. 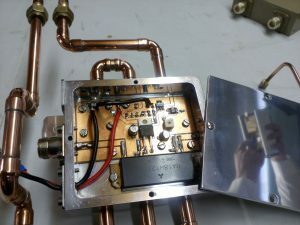 One being for home use including a partly assembled water cooled power amplifier (For an update see below) built by Adrian M0NWK. 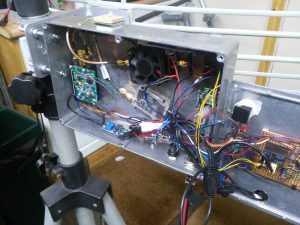 The second, and also the winner for last year, being a fully portable transceiver in a case built by Jason G7KWP. This year Started off with a similar theme. 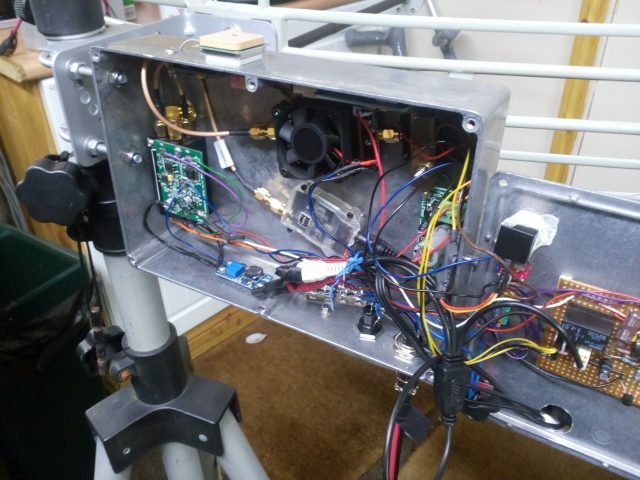 Adrian M0NWK, started off by showing us his Arduino powered controller for a comtech 23cm ATV transmitter. 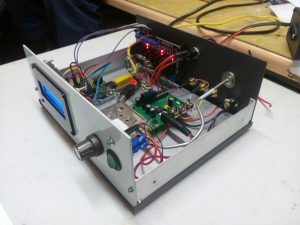 This was achieved by removing the dip switches from the transmitter and replacing them with a SSR (Solid State Relay) board. These relays are then controlled by the Arduino which also shows the selected frequency on the front LCD. Adrian also showed us the completed Water Cooled Power Amplifier which was shown the previous year. Also shown was an Arduino controlled Temperature monitor. Next up was Andy G0FVI. Who has constructed an 80m CW receiver which will eventually become a transceiver in time. By choosing an IF of around 10.695 this allowed him to use bits from numerous scrap 11m radios he had laying around. The bandpass filter was fabricated from two Toko type ferrite core coils. The first mixer is based around an SA612 chip and also provides amplification. In retrospect this may have been a bad idea as the chip does produce a few ‘birdies’ although they are well below main signal level. The VFO is an Alan Lake design for 80m with the L/C of the tuned circuit changed to give an output of 7.2-7.1 MHz. Output is buffered in the VFO enclosure and this is fed to the 1st mixer. Output of the 1st mixer is fed to a 10.7 MHz XTAL filter with a bandwidth of about 15-20KHz. 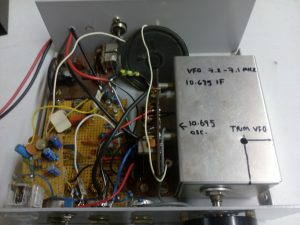 The IF amp is based around an MC1350 IC. Negative DC feedback from following stages provide AGC action (fast/slow). Demodualtion to provide audio out is achieved using a diode ring mixer. Such a mixer provides a nice clean output with little spurious signals. 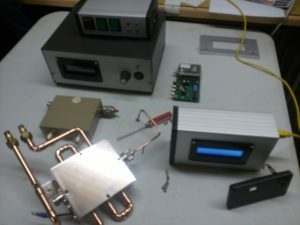 A 10.695 MHz signal is fed into the ring mixer (together with IF). Demodulated audio is fed to a 2 transistor pre-amp which also provides DC feedback for AGC. Audio is sampled at this stage and fed to another transistor amp to drive the signal meter (taken from an 11m walkie talkie!). The audio stage is based on a rather ancient LM380N! All stages were built and tested using a sig gen/scope etc. before being connected. Great care was taken with the construction of the VFO, whose spectral purity I was finally able to look at using an SDRplay RSP1A and a beta release spectrum analyser app. Controls are IF (RF) gain, volume, RIT, AGC fast/slow and VFO. 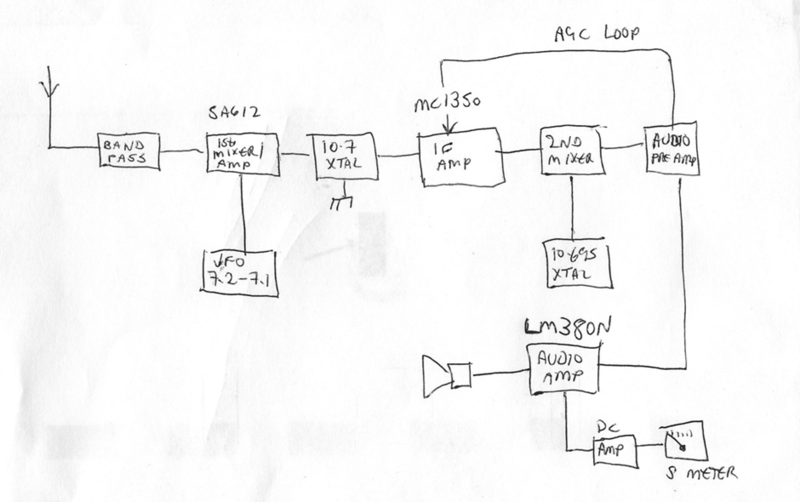 When I complete this I will add a prefabricated board for PA and some TX/RX switching (should just about fit). 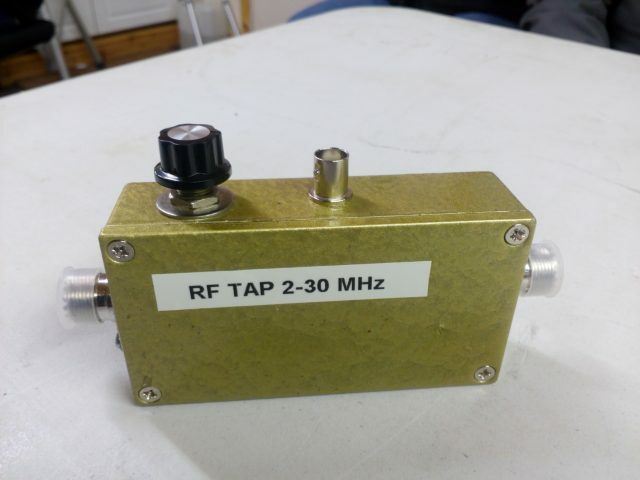 I will sample VFO and mix with TX XTAL oscillator, add some filtering and off to PA. Might be an idea to have a go at matching XTAL filter in the receiver too. 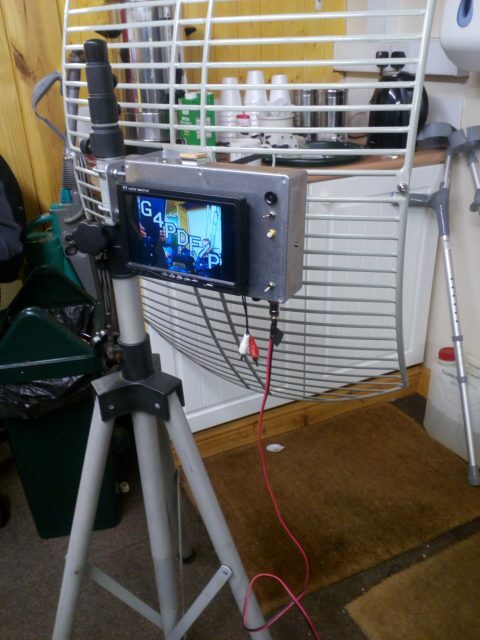 For the final item we made full circle as Bob, G4PDF, showed off his portable 5GHz ATV Transceiver. The equipment was all installed in a box which was mounted to the back of the dish which was then fixed to a tri-pod. The transceiver included a screen overlay showing his Callsign and also converted a received GPS signal into a locator which is also displayed. It was at this point after all had builds had been shown that contestants left the room for the remaining to vote on who’s they thought was the best. After discussions about complexity, imagination, modules or scratch built & uniqueness, the vote was in. The contestants were called back in and the Winner was…… Bob G4PDF, with his 5GHz ATV. The trophy will be awarded at the clubs AGM.